Photograph of a doorway of a ruined building in the Swat valley from the Archaeological Survey of India Collections taken by Alexander E. Caddy in 1896. 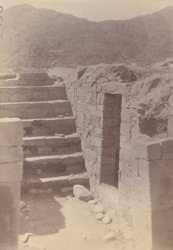 This prints shows a view looking down onto a doorway, with stone steps beyond, at an unidentified site in the Swat Valley. The ancient kingdoms of Udyana (Swat) and Gandhara (Peshawar) corresponded fairly closely with the northern part of the North West Frontier Province and the sculpture of the area, referred to as Gandharan, was influenced by Graeco-Roman elements. In 1895 Surgeon-Major L.A.Waddell went to the Swat valley to undertake archaeological research and obtain sculptures for the Indian Museum in Calcutta. Whilst there he met Major Deane, the Chief Political Officer, and well-known archaeologist who, 'generously said that he would make over to me all the numerous sculptures found in the Swat Valley, of which he had already got possession.' Alexander Caddy was sent to collect the objects and made a photographic record of them, together with sites in the area, early the following year.